The papermill is linked into the energy generation plants of the pulp mill. After separation of cooking liquor and fibres, the heat capacity of the organic residuals is utilised in black liquor boilers, thus, generating high pressure steam. The steam is driving steam turbines and generating electricity. The generated electricity is sufficient to feed all processes and is therefore self-sufficient. The paper machine uses fossil fuel in form of natural gas to heat infrared dryers. In Lenzing, incinerators for residual materials which cannot be further processed or recycled are operated. The heat capacity of the residuals is used in various processes. The fuels used are predominantly originating from renewable sources. 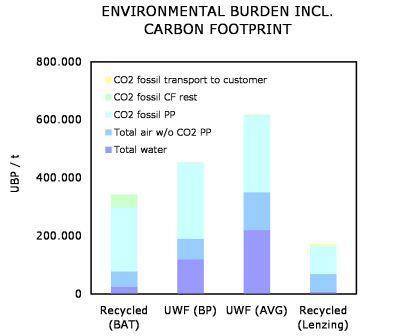 Therefore, Lenzing Papier's carbon footprint is relatively small. Indicated emissions per produced ton of paper. As a basis for the valuation , the Swiss method for the assessment of ecological scarceness has been used (ecofactors 2006), Öbu ..“ network for sustainable businesses, Bundesamt für Umwelt (BAFU), Switzerland.